Learn simple, yet effective strategies for getting the most from your customer relationship management with ROI from CRM, a new book by Brian Gardner, published by Gale Media, Inc. (paperback; $59.95; ISBN: 978-0-9906738-4-2, also available as an e-book). In this book, author Brian Gardner taps his decades of industrial sales experience to explain why CRM is about sales process, not just technology. With detailed instructions and easy-to-use tables, learn how to approach CRM as a system for sharing and leveraging data throughout your business, and how to gain a competitive edge in the market with a revamped sales process and engaged team. Whether you already have CRM or are just starting on the journey, ROI from CRM (http://www.mdm.com/roicrm) will give you the tools to successfully navigate the sales process from lead to close with CRM. 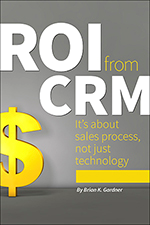 ROI from CRM is now available to order online via Modern Distribution Management at http://www.mdm.com/roicrm. Or call 888-742-5060. Gale Media is a market-leading information services and publishing company. Its two business units – Modern Distribution Management (http://www.mdm.com) and MDM Analytics (http://www.mdm.com/analytics) – provide knowledge products and services to professionals in industrial product and wholesale distribution markets. Since 1967, MDM has been the definitive resource for distribution management best practices, competitive intelligence and market trends through its twice-monthly newsletter, market intelligence reports, books and conferences. MDM Analytics provides proprietary market research and analytic services to profile market share and account potential for industrial products.